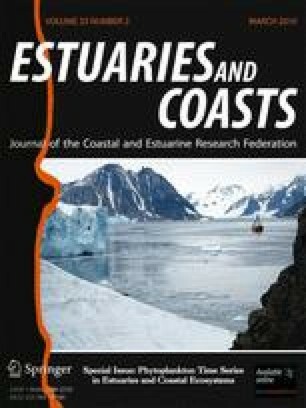 Estuarine and coastal systems represent a challenge when it comes to determining the causes of ecological change because human and natural perturbations often interact. Phytoplankton biomass (chlorophyll a) and group-specific photopigment indicators were examined from 1994 to 2007 to assess community responses to nutrient and climatic perturbations in the Neuse River Estuary, NC. This system experienced nutrient enrichment and hydrologic variability, including droughts, and an increase in hurricanes. Freshwater input strongly interacted with supplies of the limiting nutrient nitrogen (N) and temperature to determine the location, magnitude, and composition of phytoplankton biomass. Multi-annual, seasonal, and episodic hydrologic perturbations, including changes in the frequency and intensity of tropical storms, hurricanes and droughts, caused significant shifts in phytoplankton community structure. Climatic oscillations can at times overwhelm anthropogenic nutrient inputs in terms of controlling algal bloom thresholds, duration, and spatial extent. Eutrophication models should incorporate climatically driven changes to better predict phytoplankton community responses to nutrient inputs and other anthropogenic perturbations. We appreciate the assistance of A. Joyner, P. Wyrick, and J. Braddy with field support, data analysis, and illustrations. This work was supported by the North Carolina Department of Environment and Natural Resources (ModMon and FerryMon Programs, 319 Nonpoint Source Management Program), the North Carolina Sea Grant Program, the U.S. EPA–STAR–EaGLe Program, the National Science Foundation, Ecology, Environmental Engineering and Technology, the National Science Foundation Biological Oceanography Program, and Ecology of Infectious Diseases Programs. North Carolina Department of Environment and Natural Resources. 1998. Neuse River Basin water quality plan. Available at: http://h2o.enr.state.nc.us/basinwide/Neuse/neuse_wq_management_plan.htm. North Carolina Department of Environment and Natural Resources, Raleigh, NC.